Spray a nonstick skillet with nonstick cooking spray. Add 1 tsp olive oil to skillet and move skillet around to evenly distribute the olive oil. Add thinly sliced onion rings and cook over medium heat, turning onions occasionally. Next, add green peppers and bell peppers on top of onions. Cook a few minutes until onions have begun to caramelize. In a small mixing bowl, add egg whites, eggs, salt, and pepper. 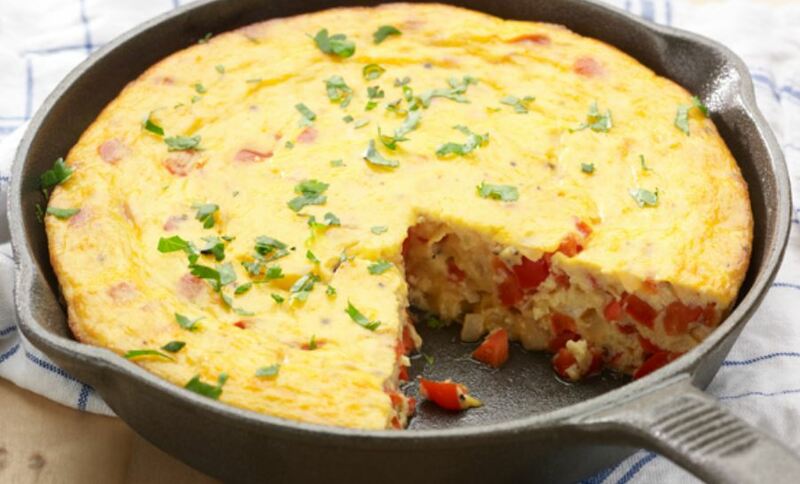 Whisk egg mixture together and then pour into skillet, making sure to cover onions, green peppers, and red peppers. When the edges begin to set, about 2-3 minutes, move skillet to oven and cook an additional 15-20 minutes. Top with cheddar cheese during the last 5 minutes of cooking to melt the cheese on top of the frittata. To serve, cut into 5 slices.